This article is about digital storage media such as CDs and DVDs. For a similarly-named anatomic feature of the eye, see optic disc. "Optical media" redirects here. For transmission media for light, see Optical medium. "Optical data storage" redirects here. For three-dimensional optical data storage, see 3D optical data storage. For other optical storage media, see optical storage. Collection of various optical disc and cassette tape formats. The optical lens of a compact disc drive. The bottom surface of a compact disc, showing characteristic iridescence. LaserCard made by Drexler Technology Corporation. In computing and optical disc recording technologies, an optical disc (OD) is a flat, usually circular disc which encodes binary data (bits) in the form of pits (binary value of 0 or off, due to lack of reflection when read) and lands (binary value of 1 or on, due to a reflection when read) on a special material (often aluminium ) on one of its flat surfaces. The encoding material sits atop a thicker substrate (usually polycarbonate) which makes up the bulk of the disc and forms a dust defocusing layer. The encoding pattern follows a continuous, spiral path covering the entire disc surface and extending from the innermost track to the outermost track. The data is stored on the disc with a laser or stamping machine, and can be accessed when the data path is illuminated with a laser diode in an optical disc drive which spins the disc at speeds of about 200 to 4,000 RPM or more, depending on the drive type, disc format, and the distance of the read head from the center of the disc (inner tracks are read at a higher disc speed). Most optical discs exhibit a characteristic iridescence as a result of the diffraction grating formed by its grooves. This side of the disc contains the actual data and is typically coated with a transparent material, usually lacquer. The reverse side of an optical disc usually has a printed label, sometimes made of paper but often printed or stamped onto the disc itself. Unlike the 3½-inch floppy disk, most optical discs do not have an integrated protective casing and are therefore susceptible to data transfer problems due to scratches, fingerprints, and other environmental problems. Optical discs are usually between 7.6 and 30 cm (3 to 12 in) in diameter, with 12 cm (4.75 in) being the most common size. A typical disc is about 1.2 mm (0.05 in) thick, while the track pitch (distance from the center of one track to the center of the next) ranges from 1.6 µm (for CDs) to 320 nm (for Blu-ray discs). An optical disc is designed to support one of three recording types: read-only (e.g. : CD and CD-ROM), recordable (write-once, e.g. CD-R), or re-recordable (rewritable, e.g. CD-RW). Write-once optical discs commonly have an organic dye recording layer between the substrate and the reflective layer. Rewritable discs typically contain an alloy recording layer composed of a phase change material, most often AgInSbTe, an alloy of silver, indium, antimony, and tellurium. Optical discs are most commonly used for storing music (e.g. for use in a CD player), video (e.g. for use in a Blu-ray player), or data and programs for personal computers (PC). The Optical Storage Technology Association (OSTA) promotes standardized optical storage formats. Although optical discs are more durable than earlier audio-visual and data storage formats, they are susceptible to environmental and daily-use damage. Libraries and archives enact optical media preservation procedures to ensure continued usability in the computer's optical disc drive or corresponding disc player. For computer data backup and physical data transfer, optical discs such as CDs and DVDs are gradually being replaced with faster, smaller solid-state devices, especially the USB flash drive. This trend is expected to continue as USB flash drives continue to increase in capacity and drop in price. Additionally, music purchased or shared over the Internet has significantly reduced the number of audio CDs sold annually. The first recorded historical use of an optical disc was in 1884 when Alexander Graham Bell, Chichester Bell and Charles Sumner Tainter recorded sound on a glass disc using a beam of light. An early optical disc system existed in 1935, named Lichttonorgel. An early analog optical disc used for video recording was invented by David Paul Gregg in 1958 and patented in the US in 1961 and 1969. This form of optical disc was a very early form of the DVD (U.S. Patent 3,430,966). It is of special interest that U.S. Patent 4,893,297, filed 1989, issued 1990, generated royalty income for Pioneer Corporation's DVA until 2007 —then encompassing the CD, DVD, and Blu-ray systems. In the early 1960s, the Music Corporation of America bought Gregg's patents and his company, Gauss Electrophysics. American inventor James T. Russell has been credited with inventing the first system to record a digital signal on an optical transparent foil which is lit from behind by a high-power halogen lamp. Russell's patent application was first filed in 1966 and he was granted a patent in 1970. Following litigation, Sony and Philips licensed Russell's patents (then held by a Canadian company, Optical Recording Corp.) in the 1980s. Both Gregg's and Russell's disc are floppy media read in transparent mode, which imposes serious drawbacks. In the Netherlands in 1969, Philips Research physicist, Pieter Kramer invented an optical videodisc in reflective mode with a protective layer read by a focused laser beam U.S. Patent 5,068,846, filed 1972, issued 1991. Kramer's physical format is used in all optical discs. In 1975, Philips and MCA began to work together, and in 1978, commercially much too late, they presented their long-awaited Laserdisc in Atlanta. MCA delivered the discs and Philips the players. However, the presentation was a commercial failure, and the cooperation ended. In Japan and the U.S., Pioneer succeeded with the videodisc until the advent of the DVD. In 1979, Philips and Sony, in consortium, successfully developed the audio compact disc. In 1979, Exxon STAR Systems in Pasadena, CA built a computer controlled WORM drive that utilized thin film coatings of Tellurium and Selenium on a 12" diameter glass disk. The recording system utilized blue light at 457nm to record and red light at 632.8nm to read. STAR Systems was bought by Storage Technology Corporation (STC) in 1981 and moved to Boulder, CO. Development of the WORM technology was continued using 14" diameter aluminum substrates. Beta testing of the disk drives, originally labeled the Laser Storage Drive 2000 (LSD-2000), was only moderately successful. Many of the disks were shipped to RCA Laboratories (now David Sarnoff Research Center) to be used in the Library of Congress archiving efforts. The STC disks utilized a sealed cartridge with an optical window for protection U.S. Patent 4,542,495. The CD-ROM format was developed by Sony and Denon, introduced in 1984, as an extension of Compact Disc Digital Audio and adapted to hold any form of digital data. The same year, Sony demonstrated a LaserDisc data storage format, with a larger data capacity of 3.28 GB. In the late 1980s and early 1990s, Optex, Inc. of Rockville, MD, built an erasable optical digital video disc system U.S. Patent 5,113,387 using Electron Trapping Optical Media (ETOM)U.S. Patent 5,128,849. Although this technology was written up in Video Pro Magazine's December 1994 issue promising "the death of the tape", it was never marketed. In the mid-1990s, a consortium of manufacturers (Sony, Philips, Toshiba, Panasonic) developed the second generation of the optical disc, the DVD. Magnetic disks found limited applications in storing the data in large amount. So, there was the need of finding some more data storing techniques. As a result, it was found that by using optical means large data storing devices can be made which in turn gave rise to the optical discs.The very first application of this kind was the Compact Disc (CD) which was used in audio systems. Sony and Philips developed the first generation of the CDs in the mid-1980s with the complete specifications for these devices. With the help of this kind of technology the possibility of representing the analog signal into digital signal was exploited to a great level. For this purpose, the 16-bit samples of the analog signal were taken at the rate of 44,100 samples per second. This sample rate was based on the Nyquist rate of 40,000 samples per second required to capture the audible frequency range to 20 kHz without aliasing, with an additional tolerance to allow the use of less-than-perfect analog audio pre-filters to remove any higher frequencies. The first version of the standard allowed up to 75 minutes of music which required 650MB of storage. The DVD disc appeared after the CD-ROM had become widespread in society. The third generation optical disc was developed in 2000–2006 and was introduced as Blu-ray Disc. First movies on Blu-ray Discs were released in June 2006. Blu-ray eventually prevailed in a high definition optical disc format war over a competing format, the HD DVD. A standard Blu-ray disc can hold about 25 GB of data, a DVD about 4.7 GB, and a CD about 700 MB. Initially, optical discs were used to store broadcast-quality analog video, and later digital media such as music or computer software. The LaserDisc format stored analog video signals for the distribution of home video, but commercially lost to the VHS videocassette format, due mainly to its high cost and non-re-recordability; other first-generation disc formats were designed only to store digital data and were not initially capable of use as a digital video medium. Most first-generation disc devices had an infrared laser reading head. The minimum size of the laser spot is proportional to the wavelength of the laser, so wavelength is a limiting factor upon the amount of information that can be stored in a given physical area on the disc. The infrared range is beyond the long-wavelength end of the visible light spectrum, so it supports less density than shorter-wavelength visible light. One example of high-density data storage capacity, achieved with an infrared laser, is 700 MB of net user data for a 12 cm compact disc. Other factors that affect data storage density include: the existence of multiple layers of data on the disc, the method of rotation (Constant linear velocity (CLV), Constant angular velocity (CAV), or zoned-CAV), the composition of lands and pits, and how much margin is unused is at the center and the edge of the disc. Second-generation optical discs were for storing great amounts of data, including broadcast-quality digital video. Such discs usually are read with a visible-light laser (usually red); the shorter wavelength and greater numerical aperture allow a narrower light beam, permitting smaller pits and lands in the disc. In the DVD format, this allows 4.7 GB storage on a standard 12 cm, single-sided, single-layer disc; alternatively, smaller media, such as the DataPlay format, can have capacity comparable to that of the larger, standard compact 12 cm disc. Third-generation optical discs are in development, meant for distributing high-definition video and support greater data storage capacities, accomplished with short-wavelength visible-light lasers and greater numerical apertures. Blu-ray Disc and HD DVD uses blue-violet lasers and focusing optics of greater aperture, for use with discs with smaller pits and lands, thereby greater data storage capacity per layer. In practice, the effective multimedia presentation capacity is improved with enhanced video data compression codecs such as H.264/MPEG-4 AVC and VC-1. Hyper CD-ROM 1 PB 100 EB 1999?-? There are numerous formats of optical direct to disk recording devices on the market, all of which are based on using a laser to change the reflectivity of the digital recording medium in order to duplicate the effects of the pits and lands created when a commercial optical disc is pressed. Formats such as CD-R and DVD-R are "Write once read many", while CD-RW and DVD-RW are rewritable, more like a magnetic recording hard disk drive (HDD). Media technologies vary, M-DISC uses a different recording technique & media versus DVD-R and BD-R.
^ Adedeji, Dr. Adewole. "COMBATING PIRACY THROUGH OPTICAL DISC PLANT REGULATION IN NIGERIA: PROSPECTS AND CHALLENGES" (PDF). Archived (PDF) from the original on 2013-08-22. ^ Cornwall, Malcolm G (January 1993). "CD means Colourful Diffraction". Physics Education. 28 (1): 12–14. doi:10.1088/0031-9120/28/1/002. Retrieved 8 October 2014. ^ Guides/Storage/CD-R/CD-RW – PC Technology Guide Archived 2009-03-30 at the Wayback Machine. Pctechguide.com (1999-02-22). Retrieved on 2011-10-09. ^ Avadhanulu, M. N. (2001). An Introduction to Lasers Theory and Applications. S. Chand Publishing. ISBN 9788121920711. Archived from the original on 2018-02-03. ^ "Playback: 130-Year-Old Sounds Revealed - Newsdesk". newsdesk.si.edu. Archived from the original on 30 September 2017. Retrieved 3 May 2018. ^ Milster, Tom D. "Optical Data Storage". The Pennsylvania State University. CiteSeerX 10.1.1.92.6992. ^ Dudley, Brier (2004-11-29). "Scientist's invention was let go for a song". The Seattle Times. Archived from the original on 2014-08-10. Retrieved 2014-07-24. ^ "INVENTOR AND PHYSICIST JAMES RUSSELL '53 WILL RECEIVE VOLLUM AWARD AT REED'S CONVOCATION" (Press release). Reed College public affairs office. 2000. Archived from the original on 2013-10-09. Retrieved 2014-07-24. ^ "Inventor of the Week - James T. Russell - The Compact Disc". MIT. December 1999. Archived from the original on April 17, 2003. ^ HAWAN KIM, SUNG. "June 2004" (PDF). Massachusetts Institute of Technology. Archived (PDF) from the original on 2013-12-04. ^ DRAWBAUGH, BEN. "HD DVD and Blu-ray movies released on June 20th 2006". Engadget International Editions. Archived from the original on 2018-04-11. ^ a b Format War Update: Blu-ray Wins Over HD DVD Archived 2008-01-10 at the Wayback Machine. Crutchfieldadvisor.com. Retrieved on 2011-10-09. ^ "Optical Carriers" (PDF). Archived (PDF) from the original on 2016-03-04. ^ "Pioneer's Blu-ray disc hits 400GB across 16-layers". www.engadget.com. 2008-07-07. Archived from the original on 2017-08-24. ^ "Pioneer's 400 GB Blu-ray Disc". www.gizmag.com. Archived from the original on 2013-09-25. ^ "100 GB Disc - M-DISC". www.mdisc.com. Retrieved 3 May 2018. ^ "LG BH14NS40 14x Blu-ray Disc ReWriter". CDRinfo.com. Archived from the original on 2012-10-11. 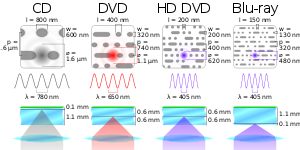 ^ "DVD, Book A – Physical parameters". MPEG. Archived from the original on 2012-02-03. Retrieved 2011-10-09. "Inventor of the Week Archive: The Digital Compact Disc". Massachusetts Institute of Technology. December 1999. Archived from the original on 2008-06-19. Retrieved 2007-07-13. Dudley, Brier (November 29, 2004). "Scientist's invention was let go for a song". The Seattle Times. Retrieved 2007-07-13. "David Gregg and the Optical Disk". About.com. Retrieved 2007-07-13. Byers, Fred R. (2003). "Care and Handling of CDs and DVDs — A Guide for Librarians and Archivists" (PDF). National Institute of Standards and Technology. Archived from the original (PDF) on September 15, 2012. O'Kelly, Terence. "Reference Guide for Optical Media" (PDF). Memorex Inc.
"The history of ideas "the optical disc as a "unique" carrier of information in the systems management". European Society of the History of Science. "Know Your Digital Storage Media: a guide to the most common types of digital storage media found in archives". USA: University of Texas at San Antonio. This page is based on the Wikipedia article Optical disc; it is used under the Creative Commons Attribution-ShareAlike 3.0 Unported License (CC-BY-SA). You may redistribute it, verbatim or modified, providing that you comply with the terms of the CC-BY-SA.